A bunion (a.k.a Hallux Valgus) is a common foot condition associated with a prominent bump on the inside of the forefoot (see Figure 1). The word bunion comes from the Greek root for the word turnip. Bunions can lead to discomfort over the prominence, especially if patients wear tight fitting shoes. It is common for bunions to run in a family and gradually increase over time. The vast majority of bunions can be managed successfully with basic non-operative treatment. Surgery is reserved for patients who have persistent symptoms in spite of appropriate non-operative treatment. Patients with bunions will often display pain over the prominent bump on the inside of their forefoot (the medial eminence). However, they may also have pain under the ball of the foot (under the area near the base of the second toe). Symptoms can vary in severity, from none at all to severe discomfort aggravated by standing and walking. There is no direct correlation between the size of the bunion and the patient’s symptoms. Some patients with severe bunion deformities may have minimal symptoms, while patients with mild bunion deformities may have significant symptoms. Symptoms are often exacerbated by restrictive shoe wear, particularly shoes with a narrow toe box or an uncomfortable, stiff, restraining upper. The primary problem with a bunion is the bone on the inside of the foot at the base of the big toe (the first metatarsal) begins to drift further to the inside of the foot (medially), away from the other metatarsals. The great toe itself ends up angled to the outside of the foot (laterally), creating a prominent bunion deformity on the inside of the foot. The bunion bump is mostly normal bone sticking out of the side of the foot, rather than a growth of new bone. In severe cases, there may also be a build-up of extra bone at the bunion site, as well as some thickening of the tissues overlying the bony prominence. Arthritis can also develop in the joint. Bunion deformities can vary greatly in their extent and in the symptoms that they cause. Symptoms are often exacerbated by restrictive shoe wear. Physical examination typically reveals a prominence on the inside (medial) aspect of the forefoot. 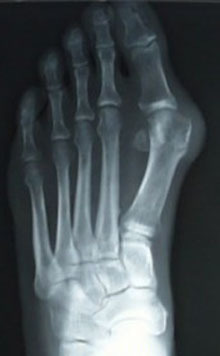 This represents the bony prominence associated with the great toe joint (the medial aspect of the first metatarsal head). The great toe is deviated to the outside (laterally) and often rotated slightly. This produces uncovering of the joint at the base of the big toe (first metatarsophalangeal joint subluxation). In mild and moderate bunions, this joint may be repositioned back to a neutral position (reduced) on physical examination. With increased deformity or arthritic changes in the first MTP joint, this joint cannot be fully reduced. Patients may also have a callus at the base of their second toe, under their second metatarsal head in the sole of the forefoot. 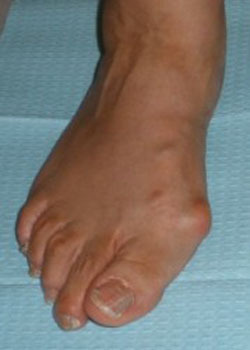 Bunions are often associated with a long second toe. If your surgeon is contemplating an operation, it is common to obtain weight-bearing x-rays of the foot. These x-rays are typically taken from the top (anteroposterior) (see Figure 2) and from the sides (lateral). Both of these x-ray views allow the status of the big toe joint (first MTP joint) to be observed. Arthritic changes demonstrated by a loss of joint space or bone spur formation may cause your surgeon to alter the treatment plan. Angles are reviewed on the anteroposterior x-ray. These include the Hallux Valgus angle (normal angle is up to 15 degrees), and the intermetatarsal angle (normal is up to 9 degrees). Often the extent of deformity correlates with the intermetatarsal angle. Mild deformities are considered from 10 to 15 degrees, moderate deformities from 15 to 20 degrees and severe deformities are greater than 20 degrees. It is important that the x-rays be obtained in a full weight-bearing position in order to adequately assess the alignment issues associated with the bunion deformity. Bunion pads: Medial bunion pads may also be helpful in decreasing the symptoms associated with the bunion. These pads can be obtained at many drugstores. Essentially they serve to lessen the irritation over the medial prominence and, thereby, decrease the associated inflammation This should be combined with comfortable non-constrictive shoes. A toe spacer placed between the great toe and the second toe can help to reduce the bunion deformity and, thereby, decrease the stretch on the medial tissue and the irritation associated with the bunion. Toe spacers can be obtained at most drug stores or online. Soft shoe inserts: Over-the-counter accommodative orthotics may also help bunion symptoms. This product is particularly helpful if bunion symptoms include pain that is under the ball of the foot. Orthotics with a slight medial longitudinal arch may be helpful for patients that have associated flatfoot deformity. These can be purchased at many sports stores, outdoors stores, or pharmacies. Bunion splints have often been used to treat the symptoms associated with hallux valgus. These splints are typically worn at night in an effort to reduce the bunion deformity. There is no evidence to suggest that these splints decrease the rate at which bunion deformities occur. There is also no evidence that clearly supports their effectiveness. However, some patients report good relief with the use of these splints. Surgery should only be considered for bunions that are painful, NOT for correction of the cosmetic appearance! The primary indication for operative intervention should be pain that is not relieved by appropriate non-operative management. Although symptom-free bunions can slowly increase in size over time, surgical treatment is NOT recommended unless significant pain symptoms develop. The prolonged recovery time associated with most bunion operations, combined with the potential for complications means that patients should be extremely cautious of undergoing bunion surgery for purely cosmetic reasons. There are many different procedures that have been described to correct bunions. The type of operation your foot surgeon recommends to correct your bunion should be dictated by the severity of your bunion deformity and the surgeon’s preference. There are well over 100 different bunion correction procedures described in the orthopaedic literature. However, the broad categories of bunion correction procedures are listed below, some of which link to a page where the surgery and recovery are described in detail. Removal of the medial eminence.